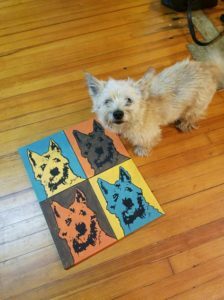 Have you ever wanted to see your four-legged friend painted in the iconic style of Andy Warhol? If so, you’re in luck—at Create Studios’ Pop Art Your Pet event this Saturday, you can do it yourself. The concept is simple: Send Create Studios a photo of your pet, and they’ll print a stencil for you to use in class. Your final painting will consist of four panes complete with the bright colors typically associated with the pop art style. The pop art pieces you’re probably most familiar with are Warhol’s Campbell’s Soup Cans or his iconic grid-like Self-Portrait in primary colors. Pop art is closely related to minimalism—both of these art styles blazed the trail for postmodern art, a style known for collages and its use of text. Ticket prices for Create Studios’ upcoming Pop Art Your Pet event vary by the painting style you choose—click here for all of the details. The class is Saturday, Sept. 15, 6-9 p.m. Create Studios is at 546 Bienville St.